I was off Island this week and found many ... both here and there. Exotic or traditional...have you found a pumpkin or two? ...the colors of Halloween can be seen in Nature itself. 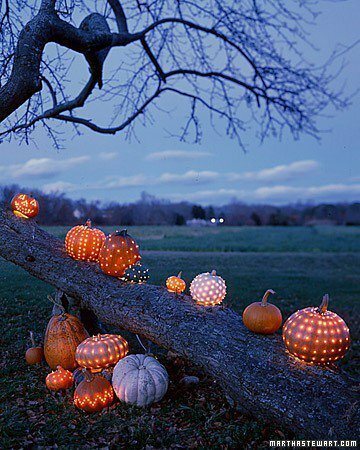 I have "borrowed" this one from Martha Stewart as it reminds me of the creative pumpkin display we often see if we visit the Witches and Their Cauldron on Main Road on Halloween. There are several families who stage "trick or treat" displays in various parts of the Island. The carved pumpkins on Main Road are a sight to be appreciated by all ages. Then there are things which remind me of a Jack O'Lantern and aren't a pumpkin at all. ** Sometimes it is just the colors of Halloween that are a commonality. Heidi Gilbertson shared this last week. The words do ring true. Not sure why I picked up this idea of a blog but I like what I am doing - sharing Island info, honoring Island people and traditions......as well as keeping my brain cells firing fiercely! Reminder: Time Change! I live with a clock-fancier and when I walked by him working on his latest project this past weekend - a Waterbury Cottage Clock - it made me check on when to turn our clocks back. Daylight Saving Time ends here this coming Sunday, November 4 at 2:00 am. 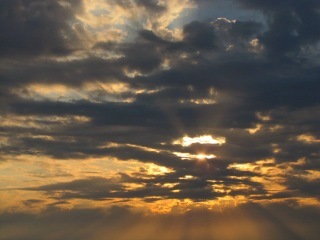 I will miss the hour of sunlight but then it has been ebbing away gradually for some time now. Wherever you are, have a great week and a Happy Halloween! * I know I took a little poetic license here as butterflies are few and far between but the colors are worth a look. I thank the Art & Nature Center for the use of this photo.